No bus drivers could use the new Fulton Street bus lane during a recent afternoon spot check - there were too many cars in the way. Two months after DOT extended the Fulton Street bus lanes from Fort Greene into Clinton Hill, how are they working out? Well, going by a recent spot check, the bus lanes are blocked so much they’re practically useless for riders on the B25 and B26. 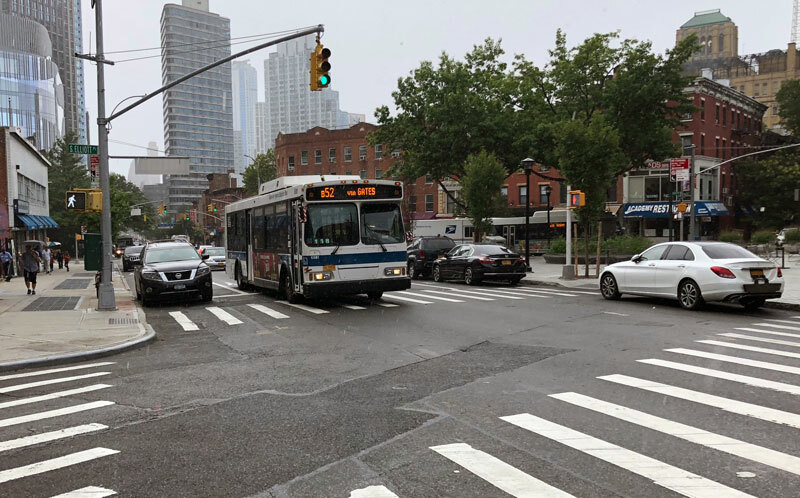 Taking a cue from a Fulton Street regular and TransitCenter’s recent bus lane inspection in Manhattan, I headed over to Fulton Street on Friday afternoon at 2 p.m. when the eastbound bus lane goes into effect. I watched for half an hour, making two sweeps of the bus lane between Fort Greene Place and Carlton Avenue, and didn’t see a single bus driver use the bus lane for even a single block. They couldn’t — there were too many cars in the way. One standing room-only bus after another went by in the general traffic lane, getting none of the benefit of transit priority. Over by Carlton Avenue, NYPD traffic agents were indeed ticketing and towing cars. Maybe, at some point later in the day, they successfully cleared some blocks. But they had an uphill battle. After two months, no habit of mind has developed among the drivers who park on Fulton Street. The bus lane was absolutely crammed with parked cars, and towing cars out of the bus lane one by one takes time. There are a few things working against this bus lane. It’s only in effect for five hours each day, from 2 to 7 p.m., so drivers have to be aware of when the rules kick into effect. Nor does the bus lane stick out and boldly declare itself — it’s not painted red. DOT reserves the terra cotta treatment for bus lanes in effect at least six hours a day. 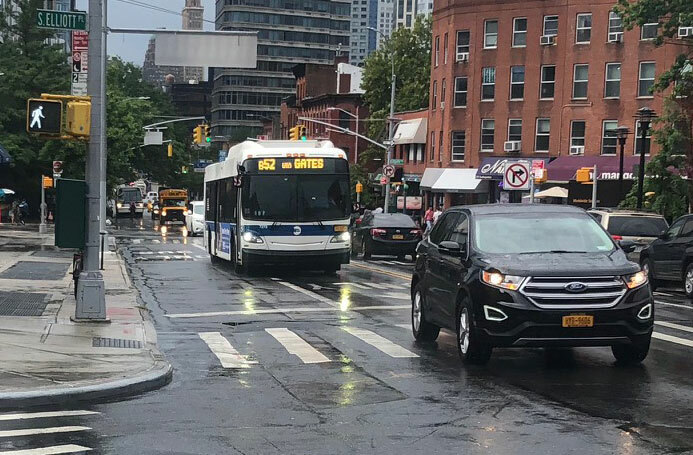 These bus lanes almost made the cut, but local businesses and Council Member Laurie Cumbo pressured DOT to cut three hours of bus priority in the morning. 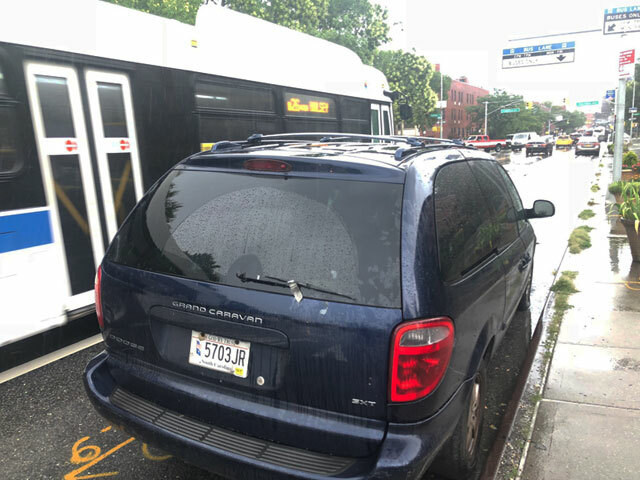 And like every other bus lane in the city, the Fulton Street bus lane is vulnerable to abuse by people who know how to cheat the system. This was the first bus to pass after 2 p.m., a B52 which uses the western blocks of the new bus lane. At the time, the bus lane was nearly 100 percent occupied by parked cars. And a traffic enforcement agent did in fact ticket the van. 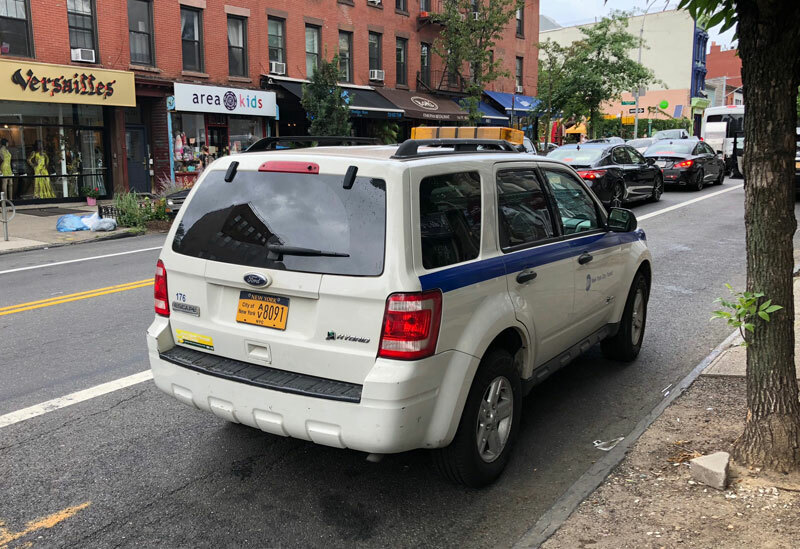 The agent, who was parked in the bus lane, told me he’d been working Fulton Street for two months and that bus lane observance is getting better. Evidence was in short supply, however. Before he did, he asked me if I’d seen a funeral. 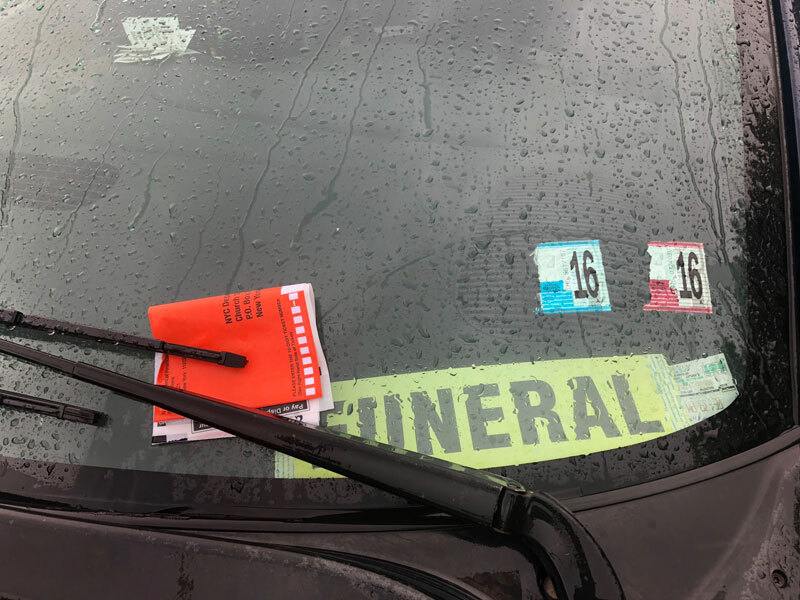 I said I hadn’t (I later looked up the nearest funeral home — it’s a half-mile walk away), but he still decided to tow another car instead. I circled back to where I started. So that was my half hour on Fulton Street, watching a bus lane that no bus ever used. Another bus lane that is always blocked is the SBS route Q44 on Archer Avenue in Jamaica. The entire curbside bus lane, although pigmented red making it very visible and obvious, is blocked with parked cars, especially during rush hour when it is most needed. It is not just an illegally parked car per block rendering it unusable, but the entire length of it is used as a parking lane with no attempt to recognize or respect it as a dedicated bus lane. The Q53/Q53 to and from Rockaway is often blocked and another terrible bus route is the Q66 on northern Blvd. It’s blocked all along the way rendering it unusable sometimes by a single car sometimes by several. In fact often on those buses we are trapped behind a parked private car in the bus lane while the bus driver tries in vain to get out of the bus lane to get past the obstructing vehicle. Sometimes as many as a dozen cars whiz by while the driver tries to get moving again. That’s why we need camera enforced bus lanes around the city. this is why we need a disintegrator ray. no, seriously, i know that’s far-fetched, but instead we should make the penalty for parking in a bus lane having your vehicle crushed into a cube. The fines need to increase. Or a fine for every bus that passes. Just allow bus drivers to use their bus to push vehicles out of the bus lanes. That will mean a busted transmission for sure, and possibly other damage. This should provide plenty of incentive to avoid parking in bus lanes. Bus lanes all over the city are the same. When I asked a traffic cop why, he pointed to the signs on 42nd St. that allowed parking certain hours of the day in the Bus Lane. It has to be one or the other – a full time bus lane or parking spots. The parking allowed on 42nd St. are the most busy hours of the day so what’s the point of making them “bus lanes”?? It’s not just in the outer boroughs. On 1st and especially 2nd Aves in Manhattan, the M15 spends more time outside the lane than in it. This also cripples intercity bus service. Ideally amtrak would be cheaper and faster, but worst part about the existing bus alternative is that they have few good routes into the city as they can’t use the parkways. License private tow companies. They take photos, and tow, and get a percentage. Stiff penalties for towing legally parked vehicles. well, sure, if you want to be all practical and realistic about it. yes. put something like those cowcatchers they used to have on locomotives on our buses and just plough right through them. This short video makes a compelling case to turn 14th Street into a car-free transit priority route when the L train shuts down. Regular bus lanes on a street shared with cars won't get the job done.